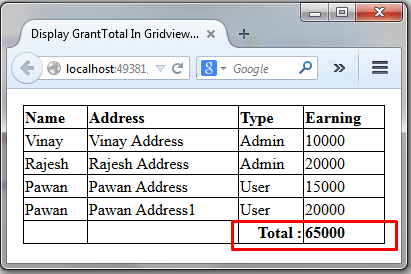 This article will show you how you Display Grand Total In Gridview Footer On RowDataBound in Asp.Net Using C#.Net. In this we will display to bind value total at run time in asp.net using c#.net. Now check the footer of the gridview in this I have added a label control in this I will display the total. On above code I have used a function to bind the data. Now I have I have added the control in footer to display the total. Now check the below code to display total value at run time. In above code I have validated when the footer row is appearing. After that I have get sum all values by using linq query, and then detected the label control to display the total. Hi The code is 100% working. but still please let me know what error you are getting. Please download the sample and try the why code is written.